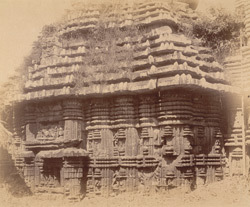 Photograph of the façade of the mandapa of the Sari Deul Temple at Bhubaneshwar, from the Archaeological Survey of India Collections, taken by William Henry Cornish in 1892. The Sari Deul temple is situated in a narrow courtyard enclosed by a low compound wall. Part of the later group of temples in Orissa (10th-13th centurury), the temple is built on a stepped plan of the sapta-ratha type. The decoration of the sanctuary and porch, depict dancers, musicians and royal processions. The temple is very similar in plan and design to the Ananta-Vasudeva temple of 1278.